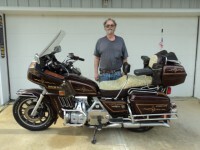 I have a 1983 Interstate with a sidecar and want to eliminate the fairing. I bought the bike last fall and was in need of lots of TLC; the brakes didn't work, etc. I had some problems with wobble with the sidecar and added a steering damper to take care of that. The bike is usually under 60 mph and ridden in rural areas and I want to go "Naked" so to speak with no fairing. Can I connect to the wiring found at the frame neck and have lights and signals as in a non Interstate bike, or do I have to jump wires on the fairing connector to get power to these wires. I have now removed the fairing and found the headlight had wires run directly from the fuse box so it would work. Any information, suggestions, etc. I'm not an electrician, so go easy. I just want to ride my grandkids and wife in safety. Thanks. You can get rid of the weight and the box it sits on.The remaining wires are for the headlight and turn signals. The toughest part is locating the turn signal and wings that hold them. Thanks, I ordered an aftermarket led light with built in turn signals that comes with arms that hold it to the fork legs. I separated two connectors behind the weight and one attached to the old headlight, but no light came on. I didn't fool with it much. It will be a while before the light arrives. I have the Unit Fork front end and the loss of the fairing helped it a lot, especially when going over bumps and it was easier to handle on the road. I might try it now without the steering damper, but will proceed with caution. The sky's the limit..... I have two Harley bagger mufflers that may go on the bike soon. Since Honda has ceased to sell all Goldwing parts, we have to try whatever's available. When I get the headlight mounted I'll post a picture of the old bike. 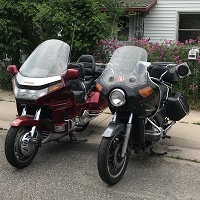 I have two Harleys too; a 2001 and a 1988. The oldest one is being slowly revived. I've tried to sell the newer one, but there must be so many of these bikes that no one has shown much interest.